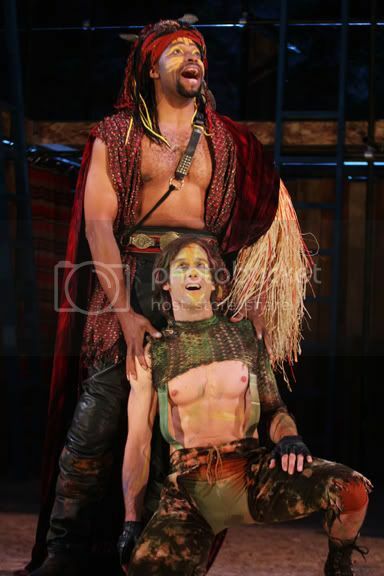 Aldo Billingslea (Oberon) and J. Todd Adams (Puck) in SSC's 2009 production of A Midsummer Night's Dream. I read A Midsummer Night's Dream in college, and maybe it was the teacher, but I didn't think it was funny. I'll be honest, it was the teacher. (This is the same guy who told us that he was writing a book about how Claudius committed all of the murders in Hamlet, instead of Hamlet himself. He was unamused when I declared that using his logic, Ophelia was just as likely a culprit.) A good teacher can nurture a love of Shakespeare, a bad teacher leaves dirty fingerprints all over your opinions and interpretations. Mom and I packed up our Festival Glen bag (seat cushions, blankets, warm clothes), and went in with an open mind. (Remember, I wasn't a big fan of Romeo & Juliet until I saw SSC perform it last year.) The Midsummer cast captured us from the beginning scene, where the actors from the play-within-a-play start the show with a STOMP-esque opening number. The show just got funnier from there. This production featured contemporary clothing, and some props that made the show both more current, funnier, as well as more accessible to the less-literary crowd. (I seriously may have hurt myself laughing when Hermia declares her undying love for Lysander while clutching a copy of Twilight.) We also thought it was terribly apropos that Hermia calls for Lysander "What, out of hearing? gone? no sound, no word?" - with a cell phone. However, the modern props don't overshadow the classic elements of the play- the fairies, nymphs, and other forest creatures are there, in all of their glory- especially J. Todd Adams (pictured above), plays an athletic, built, and cheerfully impish Puck. (I might also mention here that, wow, he is BUILT.) There were a few Cirque-worthy flips and tosses in there that only added to the authenticity of the character. Evans Eden Jarnefelt (Demetrius) was delightfully loathesome, while Emily Kitchens (Helena) just seemed a little too hysterical for my taste. Her pacing and repetitive hand gestures were overused, and whining her lines was also a poor choice. Alas, I don't direct. Titania (Lanise Antoine Shelley) and Oberon (Aldo Billingslea) commanded the stage with unmatched presence. The scheming seemed good-hearted (where I read it to be spiteful and malicious), and both played the characters sympathetically. It seems a little obvious to say that Mom and I laughed our way through this production, but really, this was side-splitting, hysterical laughter. I would definitely reccomend seeing any production done by SSC, but moreso, take your kids and teens. It is my opinion that a good initial impression of things like classical music and theater create long-lasting love of the arts. Lordy it makes me want to get out and experience a little more culture.